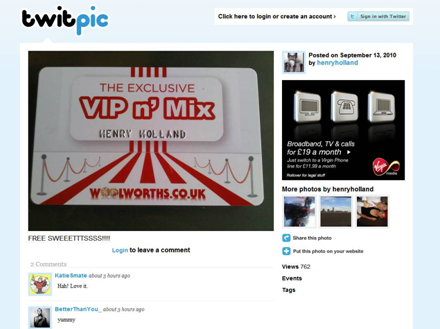 The latest must-have celeb accessory, which has got the likes of Lily Allen and Henry Holland tweeting with excitement, comes in the form of the highly sought after VIP n’ Mix card. This money-can’t-buy piece of purse candy was dreamt up by Golden Goose PR for client Woolworths.co.uk. It entitles holders to a free fix of the famous Pic n’ Mix, whenever and wherever they get the urge. Dizzee Rascal, Fearne Cotton, Chris Moyles were also amongst the first to put the card to good use. The geese were particularly excited when Aston from JLS called to find out what sugary delights he could get his hands on.